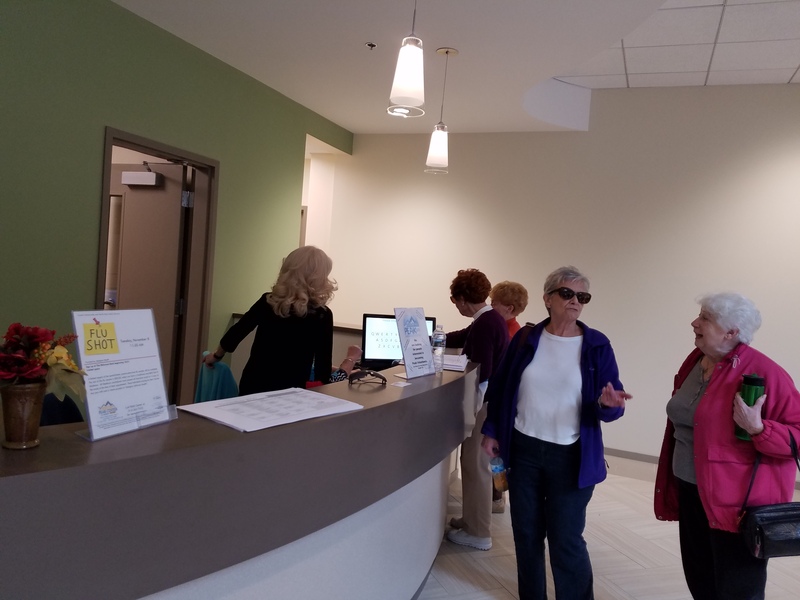 Greater Harleysville and North Penn Senior Services (GHNPSS) - North Penn Commons Update! Visit the NEW North Penn Commons website! Comment Please by Univest featuring The PEAK Center, Manna on Main Street, Advanced Living Communities and North Penn YMCA. Listen here. We have moved in! Stop by and see us at our new home. “The start of construction puts us one step closer towards moving into a beautiful new facility where we can work together with the partners to serve our community,” said Katie Walker, Executive Director of Greater Harleysville North Penn Senior Services which operates Encore Experiences at Harleysville and The PEAK Center in Lansdale. “The Peak Center is thrilled to be part of this project,” said Walker. The campus will be home to Advanced Living Communities which will provide 60 affordable independent living apartments for seniors; a larger, upgraded space for Manna on Main Street to operate its soup kitchen, choice food pantry and the new North Penn Commons public café; and The PEAK Center, which offers programs to help older adults live independently and remain active. The North Penn YMCA is also upgraded and expanded to house a zero-entry family pool, a six-lane multi-purpose pool, new locker rooms, and modern program spaces. “In our new home, the same spirit that has animated Manna for 32 years will continue supported through the care of engaged volunteers, donors and neighbors ,” says Suzan Neiger Gould, Executive Director of Manna on Main Street. “With proven programs and by taking full advantage of new possibilities through collaborative programming, we will serve the neediest amongst us, welcoming all at our table and guided by our vision That everyone might be fed,” says Gould. “We are excited this project is moving forward and our partners will begin construction. North Penn Commons will be a national model our community can be proud of,” said Bob Gallagher, President of the North Penn YMCA. Applications for Advanced Living’s residential apartments are now available. Anyone interested should contact an admissions coordinator at 215-362-0227 for more information. Construction is scheduled for completion late in 2016. North Penn Community Health Foundation and Advanced Living Communities Announce $11.6 million award over ten years in support of North Penn Commons. Lansdale, PA – July 16, 2013 – The North Penn Community Health Foundation held a press conference this morning to share new developments and details on North Penn Commons, formerly known as the Lansdale Collaboration Project. Advanced Living Communities and the North Penn Community Health Foundation recently received notice from the Pennsylvania Housing Finance Agency that the North Penn Commons project was awarded $11.6 million in low-income housing tax credits over a ten year period. With the receipt of this funding, North Penn Commons has secured the core funding necessary to proceed into its pre-construction phase with an anticipated completion in the spring of 2015. North Penn Commons is a pioneering partnership among Advanced Living Communities, The PEAK Center, Manna on Main Street and the North Penn YMCA. By joining forces, a new vision for North Penn communities will be realized. A vision that focuses on the extraordinary impact North Penn Commons will have on building healthier lives by offering all generations the opportunity to thrive and be happy at every stage of life. Through this unique partnership, 60 units of affordable housing will be constructed on the former LansBowl site, now owned by the YMCA. The PEAK Center and Manna on Main Street will relocate their programs and services to North Penn Commons. A public space will link this four-story facility to the current YMCA that will undergo a significant facelift including construction of a new family fun pool, and new locker room facilities. With the assistance of Philadelphia-based fundraising counsel, Schultz & Williams, North Penn Commons’ partners are coordinating their fundraising efforts in a single campaign, One Four All, to jointly approach local, regional and national donors and share all proceeds from this campaign. The One Four All campaign goal is $5 million, which is critical to filling the gap left between the acquisition of low-income housing tax credits, other county and state funding and the cost of the project. The campaign has raised $653,000 in gifts and pledges over the past 9 months. The North Penn Community Health Foundation is generously underwriting the fundraising expenses for the campaign in addition to its investment of $340,000 in planning expenses to help establish the partnership and define the parameters for this uniquely collaborative project. All photos by Tamela Luce.